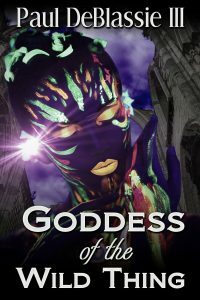 In Goddess of the Wild Thing, Eve Sanchez, a middle-aged woman and scholar of esoteris studies, encounters a seductive man with a frightening side to him… Sam is a bit of a ladies man, arrogant, confident, and I was a bit wary of him at first. He grew on me, though, and I began to like him as the book progressed – however, never as much as I liked Eve. Eve was a balanced character, sometimes confident, sometimes lacking confidence. She was looking for love, for the feeling of belonging somewhere, and her own search and spiritual journey made it easy for me to relate to her. Part of the book is set in a supernatural world, in Aztlan del Sur, and Eve’s quest is not so much a quest to save herself or others, but more of an inner journey, a spiritual journey, to discover what love is, whether bad love is better than no love, and the meaning of it all. The ‘villain’ of the story, Sweet Mary, is quite an interesting character too, and when all the dots connected, the inner story with the events happening throughout the book, I was pleasantly surprised. Fans of psychological thrillers with paranormal elements and a lot of magical sybolism will no doubt enjoy this book. Thank you for hosting Goddess of the Wild Thing!